The site of Lingrin tou Dhigeni is located in Southwestern Cyprus between Paphos and Limassol in the Kapsalia Plain near the Kha Potami river. It is the site of a sanctuary of a prophetic god who is believed to have been the consort of Paphian Aphrodite mentioned by Homer, whose main sanctuary was located in nearby Kouklia, where we will be staying. The village of Kouklia is a typical, friendly Cypriot village near Paphos in southern Cyprus. Our finds are stored in the museum in the medieval castle where we work from Monday to Friday. You will spend part of your time working there, and part of your time in the field so that you can learn about all aspects of archaeology. No previous experience is necessary. 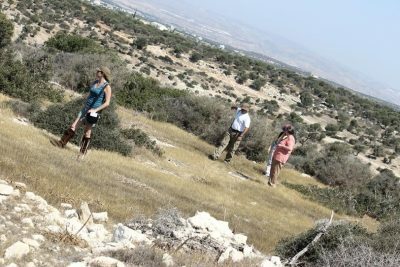 You will receive training in several areas of archaeological fieldwork including mapping, imaging, processing of finds, subsurface survey techniques (ground-penetrating radar, magnetometry, etc), and intensive survey (fieldwalking). Carleton University students can get credit for CLCV 3301B (for a 3-week session) or CLCV 4000 (for 6 weeks). You will be required to keep a daily journal and submit at least two entries for the blog on CuPortfolio. For mor information on receiving credit, please contact Dr. Banducci.